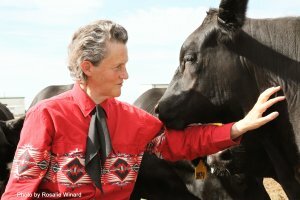 Renown animal behaviorist Temple Grandin, Ph.D., will be the opening keynote speaker for the 26th annual APDT conference set Oct. 30-Nov. 2 in Portland, Oregon. Her talk on “Understanding Animal Behavior,” will delve into the subject matter she has researched and studied throughout her nearly 50-year career that began with a degree in psychology at Franklin Pierce College in 1970, a master’s degree in animal science at Arizona State University and a doctoral degree, also in animal science, from the University of Illinois-Urbana-Champaign in 1989. She is now an animal science professor at Colorado State University. As pragmatic as she is direct, Dr. Grandin became known for her advocacy of the treatment of beef cattle and environmental enrichment for pigs, even while designing slaughterhouse operations that would kill them, which drew the ire of animal rights activists. Dr. Grandin recognized beef cattle were slaughtered for food, but it could be done humanely by interacting with the cattle to alleviate anxiety and using curved chutes to mimic their natural movement so they wouldn’t be terrified in their final moments. “Nature is cruel, but we don’t have to be,” she said. Diagnosed with autism at the age of 2, Dr. Grandin credits the brain disorder with her insight into the minds of cattle and domesticated animals, crawling on all fours through slaughterhouses to see from the steers’ eye-level what might cause them to balk or startle, such as shadows or even something like a jacket left hanging over the chute. After seeing how cows could be calmed in a squeeze chute during inoculations, Dr. Grandin designed one for herself to hug away her anxieties, where she could control the amount and length of pressure since she could not bear the touch from a human. Dr. Grandin was named a fellow of the American Society of Agricultural and Biological Engineers, has been awarded numerous honorary degrees and featured in a wide range of broadcast and print media. She has written scores of articles and books about autism, animal behavior and animal welfare. She was featured in a book by Oliver Sacks called “An Anthropologist on Mars” in 1995, and then in 2010, was portrayed by actress Claire Danes in the biopic “Temple Grandin” produced by HBO. The film, nominated for 15 Emmy Award nominations, won seven, including Best Made-for-Television movie and the Best Actress in a Drama for Danes, who also won best actress in the same category at the Golden Globe, Screen Actors Guild and Satellite award programs. Dr. Grandin has often said she would not wish away her autism since it gave her the insights and sensitivities into understanding the behaviors of the livestock. Autism was part of her, making her “different, but not less,” she explained. Animal behavior is also more complex, that not all stress is the same. “Fear, pain or separation, don’t lump them together, they are not the same. Fear and rage are even in separate brain areas,” she has pointed out among the hundreds of lectures she has given, or articles she has written. For example, she cites a viral video of cattle chasing a small remote-controlled vehicle, but then dart away from it when it turns toward them. Prey animals such as cattle who startle easily will voluntarily approach something new in their fields or corrals but will determine it’s “scary” if that same object is shoved in their face, she said. A sign of stress in a dog may show up on a muzzle that is graying before the dog is age four. There is a give and take in how a dog’s place in society has adjusted over the years. “Today many towns have strict leash laws. This may have reduced opportunities for dogs to socialize with both people and other dogs. When I was a child in the 1950s, the neighborhood dogs roamed the neighborhood. Behavior problems and dog bites were seldom a problem because all the children and the dogs knew each other. The down side was dogs getting hit by cars. Life for dogs in the 1950s was more dangerous, but it may have provided dogs with a better social life. To give a dog a good social life today requires much more work by the owner. In Fort Collins (Colorado) where I live, leash laws are strict. Even when the owner is with the dog, it must be on a leash unless it is in a dog park,” she wrote in a recent email for this article. Conference registration will open in March. Please watch the APDT website at www.apdt.com for more information.